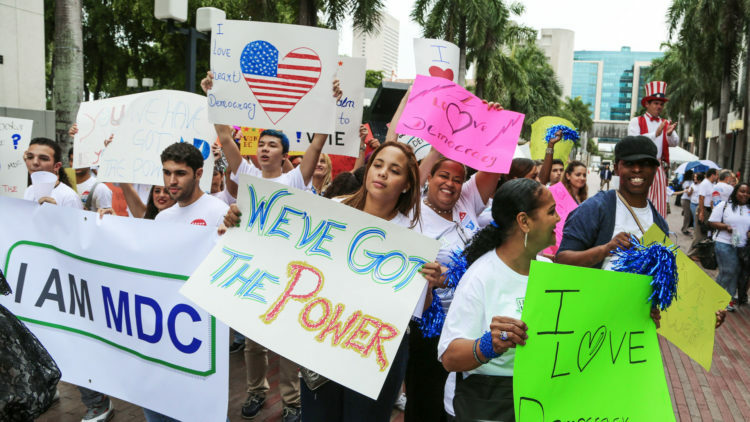 As this historic election season continues, Miami Dade College doubles down on its goal to be the number one college in America when it comes to voter engagement. Long a leader in the national TurboVote initiative, MDC has formed a partnership with the group to provide students with a one-stop, online voting resource. TurboVote allows you to register to vote, sign up for election reminders and request vote-by-mail ballots. Those who are already registered to vote are also encouraged to sign up so they can receive election reminders by text and email. MDC already has an impressive track record in the area of voter and civic engagement. As of the 2014 election cycle 4,395 MDC students signed up for TurboVote, ranking number one nationally, surpassing Harvard’s 3,063 applications, Columbia’s 1,651 and Stanford’s 864. TurboVote is the centerpiece of a larger College initiative that involves multiple events, activities, partnerships and a team of more than 20 students who are working on campus as voter engagement interns to provide voter assistance and information. In addition, MDC has launched mdc.edu/vote a website where students, faculty, staff and the community can find voter related information and resources. Working hard to earn recognition as a voter friendly institution and the All in For Democracy college designation, MDC is hosting a series of major events to encourage everyone to head to the polls and make their voices heard. The push begins on Sept. 27 when the College leads the countywide National Voter Registration Day hosted at North Campus to promote voter registration, voter engagement and voter turnout. Partnering on the event are MDC’s Student Life, student deans and iCED, along with Miami-Dade Department of Elections, the League of Women Voters, and the Bus Federation. We Want You To Join A Campaign! If your last few experiences with voting in Florida haven’t exactly been fun, then here’s your chance to re-connect with the joy of voting. On Oct. 26 at Wolfson Campus, the College will partner for the first time on a new national project designed to reinvigorate the culture of voting in Miami. Spearheaded by Citizen University, a non profit dedicated to addressing low voter turnout in local elections, “Election Extravaganza” is a joyful, daylong festival with mock elections, entertainment, performers and voter information, all culminating in trips to Government Center for early voters to cast their ballots. Instead of dwelling on partisan conflict, the event will encourage people to “join the party” and vote with a smile. Miami Dade County Elections Department is seeking poll workers. This is a great opportunity for MDC students who are registered voters to actively participate in the elections beyond casting a vote. You will receive training and get paid for your time. Get more details and fill out an application now.